Momentum Performance Turbo Kit - Dezod Motorsports Inc - Home of the automotive performance enthusiast since 2002. The Momentum Performance Turbo Kit has been put together with the express intent of helping street tuners and track junkies “Push Forward” and achieve their performance goals. The kit offers a fully scalable turbo solution, allowing owners to plan out their starting point and upgrade path with exceptional versatility. 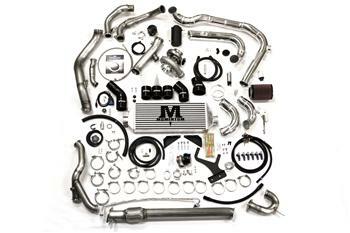 The Momentum Performance Single Turbo Kit is capable of producing between 400 WHP (stock motor) and 600 WHP (fully built motor). Two years and 25,000 miles of on-track testing have helped Momentum to develop on of the most durable and highest performing turbo kits on the market. Reliability is assured through the use of the highest quality proprietary components, such as TIG welded, CNC mandrel bent piping, as well as partnerships with leading aftermarket manufacturers Garret, Tial, Deatschwerks, UpRev and Walbro. The kit’s high end design and components also ensure that it offers a smooth and easy installation process and looks great under the hood – important hallmarks of the “Push Forward” philosophy. Note: Momentum Performance does not recommend any power increase over 300whp on a stock automatic transmission. A valve body upgrade is highly recommended for any power increase over 300whp. Possible damage may occur if these power numbers are exceeded on a transmission without upgrades.